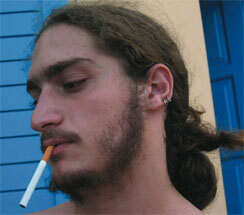 He was born in Volos, Greece, in 1983. He has studied at the faculty of Architects Engineers at the Technical University Of Athens, since 2001. He got a scholarship from IKY in 2004 and in the period 02/2005-08/2005, he lived in Lisbon, participating in the Erasmus- Socrates program, at the NOVA Universidade de Lisboa. He has participated in short movie competitions (3rd european meeting of young creation -2003 / international web contest micropolis-netodyssey -2006, etc. ), competitions for posters/logos, photography contests and architectural contests. He has been occupied with music, by joining in music groups, since 1999. At the same time he has been occupied with digital photography and he works as an collaborator architect in an Athens firm.